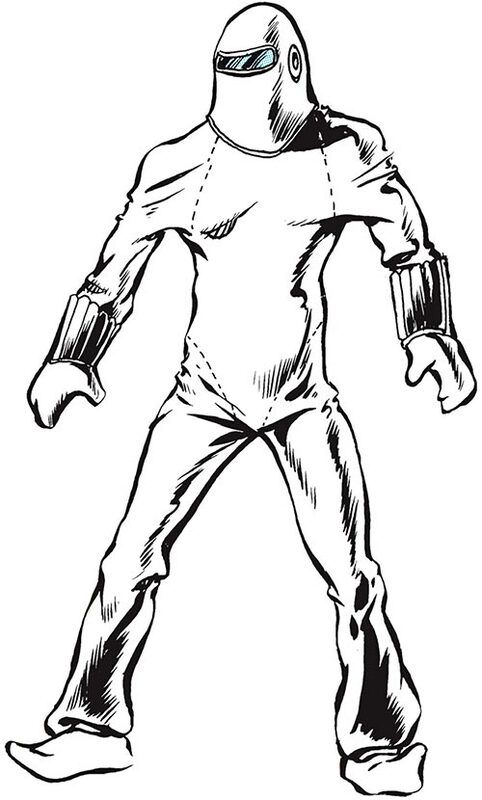 The original Human Bomb appeared in 1941, in Police Comics. He shared the spotlight with Plastic Man and Phantom Lady, as you can see if you have adverts enabled on writeups.org. Since the lead advert is the cover of Police Comics #1. You do have adverts enabled on writeups.org, right ? 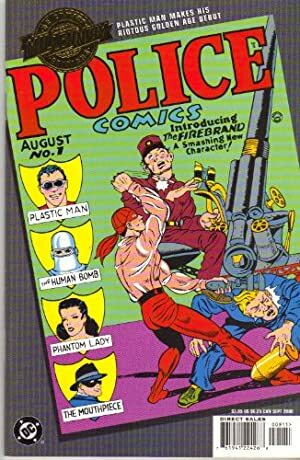 Police Comics was published by Quality Comics, but this publisher’s IP was eventually bought by DC. Back then there were multiple Earths in the DC Universe, so these characters were retroactively considered to exist on Earth-Quality and Earth-X. See our article about the ages and Earths of DC Comics if the previous sentence was gobbledegook for you. The following are very simple, very old notes concatenating Mayfair and DC material. This was done during the 1990s, back when it was difficult to find older books. Known Relatives: Professor B. Lincoln (father, deceased). Base Of Operations: Washington; D.C. (also American West Coast). Group Affiliation: All-Star Squadron, Freedom Fighters. By touching an object with his bare hand, the Human Bomb releases tremendous explosive force. It is strong enough to shatter virtually any substance. The Human Bomb is immune to his own explosions and, within limits, to other forms of impact. This includes that of bullets. He must either wear his “fibro-wax” gloves to keep from blowing up whatever his hands touch, or use a special damper device to neutralize his powers. The Bomb is an above-average hand-to-hand combatant even without using his power. Roy Lincoln was a brilliant chemist. He was assisting his father, a famous explosives expert, in working on a new, incredibly powerful chemical known as 27-QRX. Nazi agents, intend on stealing the formula, confronted the two chemists in their laboratory. One agent shot and killed Roy’s father. Roy fought the agents and, to prevent them from ever getting the formula, swallowed the chemical. The result was that the tremendous power of the chemical was somehow concentrated in Roy’s hands. It manifested as energy he could release with destructive force. Using this power, Roy defeated the agents. Lincoln adopted the costumed identity of the Human Bomb in order to use his newfound power to battle crime and subversion. He had to wear “fibro-wax” gloves at all times so as not to release his power accidentally. The Human Bomb, of course, joined the All-Star Squadron. But he also was part of those recruited in the Squadron by Uncle Sam to battle the Axis menace on the West Coast. This group, the Freedom Fighters, was chiefly responsible for protecting American shipyards in and around San Diego and San Francisco from Axis sabotage. 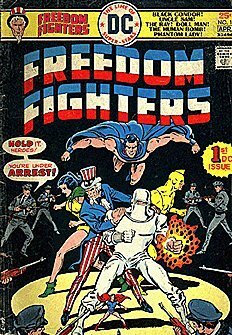 The Freedom Fighters disbanded when Uncle Sam disappeared after the Axis surrendered. The Human Bomb’s ultimate fate is unrevealed. Pre-Crisis, the Freedom Fighters had convoluted adventures between Earth-2, Earth-X (a timeline where the war went on well into the 60s) and Earth-1. But that doesn’t exist anymore. Now, with Hypertime, perhaps events akin to what happened to Earth X have actually happened. Who knows ? Just don’t confuse him with Heatwave. Bomb is Always On (whenever he touches something, it explodes). Stroke of Genius, Scholar (Chemistry). All-Star Squadron (Low), Freedom Fighters (High), Doll Man (high). FIBRO-WAX SUIT [BODY: 08, Bonus : Immune to his Bomb power, i.e. it does not explode]. Compiled by Sébastien Andrivet (stats from World at War, history from Who’s Who).